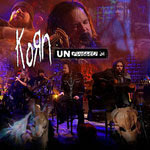 You might think that a Korn unplugged album sounds like a bad idea. And I did too, before I heard "Freak on a Leash," featuring Amy Lee (of Evanescence), on the radio yesterday. Then, I knew for certain that it was a bad idea. It hits stores on March 6, but if you value your money, you'll avoid this one like the plague. Look, I'm a big fan of Korn, but their music just doesn't translate well into acoustic. Not only that, but Amy Lee's voice doesn't blend well with Jonathan Davis's voice. It's just overall a bad idea, and it sounds like it was poorly executed as well.